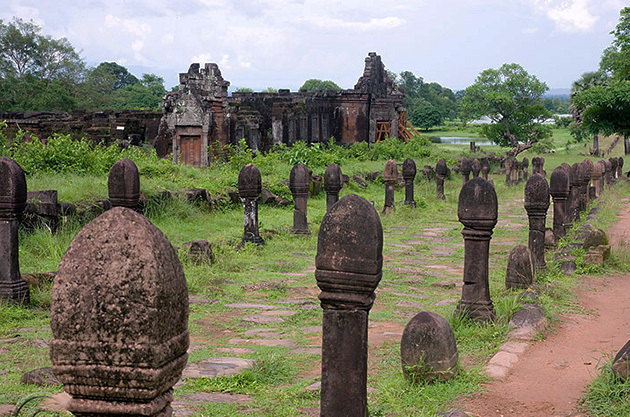 Champasak was once, 1400 years ago, the centre of power in the lower Mekong basin, later a revered outpost of the Khmer Angkor empire and later still one of the three kingdoms to rule over the remains of Lane Xang. A fine heritage that, according to the last prince of Champassak, was brought to hard times by a former queen’s indiscretion. Though the Kingdom of Champasak prospered for a while after the final dissolution of Lane Xang, at the beginning the 18th century, its fortunes faltered quickly and it was reduced to a vassal state of Siam before the century had passed. For its part in Chao Anou’s abortive attempt to win freedom from the Siamese for the Lao kingdoms, Champasak lost all of its territory east of the Mekong. Under French rule the once mighty kingdom became a mere administrative block; its royalty stripped of many of its privileges. Boun Oum, who died in French exile in 1980, may have griped about his family’s downfall (though he was not a direct descendent of Nang Pao), but it did not stop him from using his remaining royal privileges to loot the nearby Wat Phu. The magnificent Angkorian temple complex was recently made a UNESCO heritage site and is considered one of the finest Angkor-inspired edifices outside of Cambodia.